Protein aggregation is generally believed to occur as the result of two instability factors— conformational and colloidal. Conformational stability is the difference in free energy between the folded and unfolded states of a protein. Although not directly measured as a value of energy, the Melting Temperature value of TM or to another extent, the Aggregation Temperature, TAgg, can qualitatively determine increased or decreased conformational stability between formulations. Colloidal stability is a result of balancing attractive and repulsive intermolecular interactions. Seemingly obvious, the less protein-protein interactions take place, the less likelihood there is for a sample to aggregate. Thus, many research topics and publications have concluded that understanding the osmotic interaction second virial coefficient (B22) is a valuable screening tool for predicting the aggregation propensity of proteins in a formulation state. ARGEN, by Fluence Analytics, can derive values for both TAgg and B22 in varying formulation conditions. This application note describes the method in which ARGEN is used to characterize B22 and the approximate weight average molecular weight for a monoclonal antibody. ARGEN measures the scattered light radiation from a solution of molecules that is acted upon by a vertically polarized laser light source. The intensity of this scattered light is directly related to the size and concentration of those molecules as defined by the Zimm equation, Equation 3. This intensity is found by solving the excess Rayleigh ratio, Equation 1, which ARGEN measures by correlating the scattered light from the sample to that of a reference sample or solution. In the case of this ARGEN analysis, Toluene is generally utilized as this reference solvent. 90Scatsolvent is the Scattering Intensity for the pure solvent. Typically, this is the solvent used to dilute the sample that is measured. This value is recorded and automatically determined for each cell upon running a “Solvent Baseline” experiment for that cell. 90Scatreference is the Scattering Intensity of Toluene, a good Rayleigh scattering solvent. This value is recorded and automatically determined for each cell upon running a “Reference Baseline” experiment for that cell. IAbs, Tol is the Absolute Rayleigh Scattering Ratio for Toluene at the wavelength of the laser used. ARGEN uses a laser wavelength of 660 nm, therefore IAbs, Tol =1.19E-5 cm-1. F is determined by the optical correction factor of the instrument. For ARGEN this value is F = 0.95. Conc. is the Concentration of the sample. 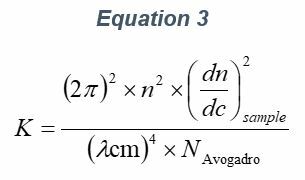 q2 <S2>z is the term for z-Average mean square Radius of Gyration. B22 is the 2nd Virial Coefficient for the sample in the solvent in which it is dissolved. n is the index of refraction of the pure solvent. (dn/dc)sample is the differential index of refraction increment of a solvent with respect to the concentration of sample dissolved in that solvent. ARGEN automatically calculates the value of K upon entry of n and on the experiments page. The Y-intercept value of this plot is equal to the 1/Mw of the molecule in solution, and the slope of this plot is equal to 2x the virial coefficient B22. This is displayed in Figure 3. A 2 mL total volume stock solution of mAb was prepared at 0.05 g/mL. This solution was then pre-filtered with a 0.22 µm cellulose acetate syringe and set aside until the ARGEN experiment was configured to collect data. To ensure that no thermal stress was introduced to cause aggregation in the mAb sample, the temperature of the ARGEN cell was set to 25 ºC and thermally controlled by ARGEN’s internal Peltier Thermoelectric Cooling (TEC) device. Once the cell’s temperature stabilized, the sample cell was placed into a holder with pure, filtered buffer solution to collect a background solvent baseline scattering signal. The data collection then started at 10 points per second. After collecting the solvent baseline, the buffer solution was replaced with 1 mL of the pre-filtered mAb solution. Since there is a significant increase in scattering intensity between the pure buffer and the 0.05 g/mL solution of mAb, the ND filter for the sample cell was adjusted to ensure that the initial baseline scattering value did not saturate the onboard CCD camera but also started above 50% of full scale. 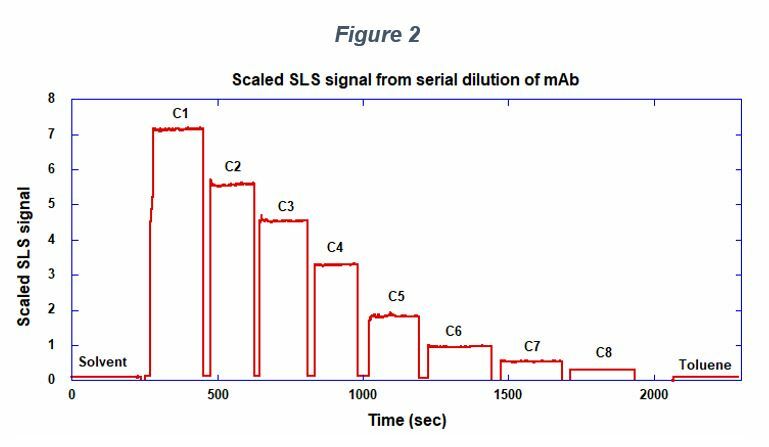 Unlike an aggregation monitoring experiment when the light scattering signal is expected to increase over time, in this case, the light scattering signal is expected to decrease as the concentration of the mAb sample is reduced by serial dilution. Once the scattering value was appropriately set, a baseline value was collected so that this value could be interpreted into the excess Rayleigh scattering intensity. Next, a volumetric pipette was used to serially dilute the sample to ensure accurate concentration values. The scattering baseline was collected for each concentration of the dilution procedure. When the raw scattering signal reached less than 20% of full scale, the ND filter was again adjusted so that the signal was increased to improve resolution. Figure 1 depicts this as indicated by the arrows at steps C5 and C6. Since the sample concentration is constant at each of these steps, the raw scattering signal can be multiplied by a scalar value to normalize all baseline scattering values. 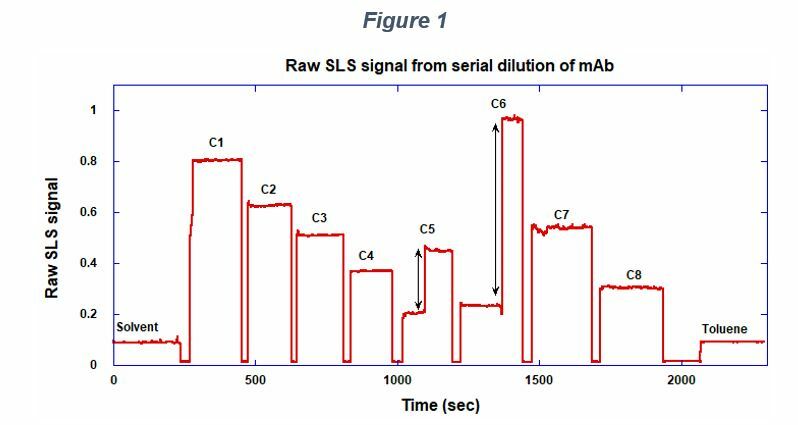 The result of scaling the Raw SLS signal is shown in Figure 2. The raw data was scaled so that all scattering signals were normalized to effectively zero neutral density. This enabled the recording of each baseline value for an analysis as described in the Light Scattering Analysis section. 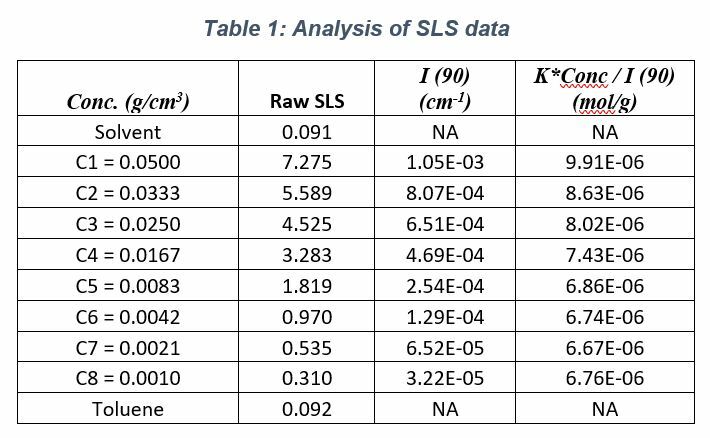 The values for each scattering baseline are in Table 1, along with the corresponding Rayleigh scattering intensities and values of K*Conc. / I(90). To determine the Optical Component K, the index of refraction for the buffer solution was considered equal to that of pure water, therefore n = 1.33. Additionally, the differential index of refraction increment for monoclonal antibodies was found from various literature sources as, dn/dc ~ 0.185 cm3/g. Using these values, the optical constant value is determined to be, K = 2.089E-7 mol*cm2g-2. 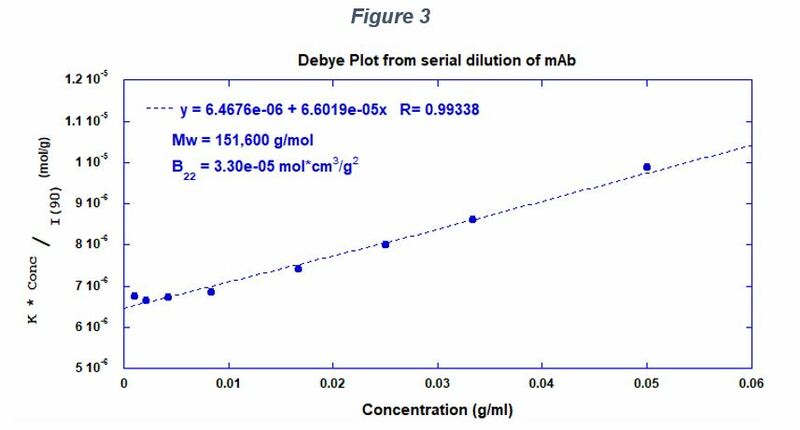 The slope and Y-intercept of the linear fit to the Debye data indicate that the molecular weight of the monomeric form of this monoclonal antibody is 151,600 g/mol, and the second virial coefficient is 3.3E-05 mol*cm3/g2. These values correlate with reference values found in literature. The method and data show the utility of ARGEN to generate data that reveals both the Molecular Weight of a protein molecule as well as the osmotic interaction second virial coefficient of that molecule in a formulation. This information, as discussed in references 1, 2 and 3, indicate that a user can utilize the second virial coefficient to understand the propensity of a protein sample to aggregate in differing formulation conditions. Furthermore, ARGEN’s 16 independent sample cells allow users to multiply their data by 16 and make direct comparisons of B22 to study multiple formulations at once. Thus, this is another way to utilize ARGEN as a tool for quantifiable and faster formulation development.